Step up! With the CAPITAL SPORTS Minioval mini bike you can increase your fitness whenever and wherever you want. Whether at work, watching TV, reading or talking on the phone, the space-saving elliptical bike fits perfectly under the desk and allows training both while seated and standing. Thanks to the three-step adjustable angle, you can adjust the pedals perfectly to seated or standing training. 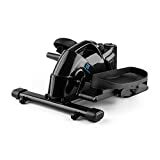 Space-saving mini home trainer for an uncomplicated workout while seated or standing. for monitoring the performance data.